The hot pressing of oilseed refers to the application of heat in conjunction with mechanical pressure. 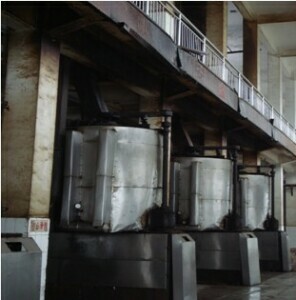 In an oil milling plant hot pressing heats the oilseeds using a specialized hot pressing machine which raises the temperature of the seeds in order to extract more oil. 1. All primary components of KMEC's hot pressing machines are made of high-grade alloy steel which have undergone a special hardening treatment. This greatly improves durability, extending the machine's work life despite exposure to high temperatures and constant abrasion while working day and night. 2. Settings of the hot pressing machinery are adjustable to handle a variety of oilseed types to yield oil of the highest quality. 3. The whole process—from feeding to steaming, up to the discharge of oil and cake is performed automatically and continuously, thus making the machinery easier to operate with a reduced labor requirement.